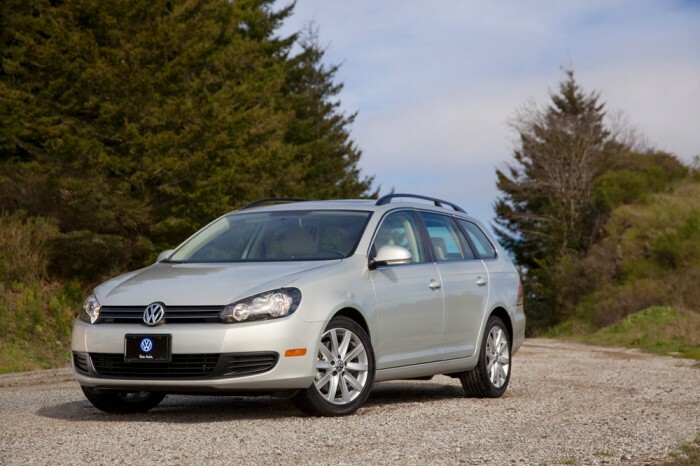 There are no new changes for the 2014 Volkswagen Jetta Sportwagen. As the only non-luxury European station wagon exported to the United States, there’s no denying that the 2014 Volkswagen Jetta Sportswagen is something special. Subtle curves throughout the body and fresh, clean lines create a unique station wagon silhouette that still remains sleek. The simple front façade adds a Volkswagen-esque feel to the profile as well, while roof rails create a versatile feel for the wagon. A standard 2.5-liter five-cylinder engine powers the front-wheel-drive VW Jetta Sportwagen S and SE, producing 170 horsepower and 177 lb-ft f torque. A five-speed manual transmission comes standard on the S with an optional six-speed automatic, which comes standard on the SE. There is also a diesel powertrain for the Sportwagen with a turbocharged 2.0-liter diesel four-cylinder engine powering the Sportwagen TDI, producing 140 hp and 236 lb-ft of torque. The diesel powertrain comes standard with a six-speed manual transmission with an available six-speed automated manual option. EPA-estimated fuel economy for the 2.5-liter tradionally powered engine comes in at 26 mpg combined with the manual transmission and 26 mpg combined for the automatic. The diesel Jetta Sportwagen boasts an outstanding 34 mpg combined with the manual transmission and 33 combined with the automatic. High-quality materials, soft-touch surfaces, and attention to detail come together in the Jetta Sportwagen to create one of the best interiors in its class. An adjustable center console armrest and rear seat air vents make sure everyone is comfortable, while the premium-vinyl “leatherette” upholstery in the SE and TDI models looks and feels like it is actually real leather. Passenger and cargo room is abundant, though there is more room in the front seats than the rear. According the the Insurance Institute for Highway Safety, the Sportwagen is worth of their top rating of “Good” in the moderate-overlap, side-impact, and roof-strength tests. Standard features for the 2014 Jetta Sportwagen include antilock disc brakes, stability and traction control, front sead side-impact airbags, and full-length side curtain airbags. The TDI models also come standard with a rearview camera, though the camera is not available on the traditionally powered models.